I recently conducted an internet search on “2019 manufacturing trends”. Each resulting article focused on the same concepts: automation, block chain, smart manufacturing, connected devices, internet of things, intelligent supply chains, and cybersecurity. The future of manufacturer is trending toward the smart factory. As a small or medium-sized manufacturer, you may be wondering how you can reasonably begin to adopt smart technologies. One approach is to include smart manufacturing integration as part of your continuous improvement journey. Most companies are familiar with the lean term “kaizen” – meaning minor incremental changes. However, many may not be familiar with the radical change concept of “kaikaku”. Kaikaku is about introducing new knowledge, new strategies, new approaches, new production techniques or new equipment. With kaikaku, the first action should be developing a high-level strategy for your smart manufacturing vision. UT CIS can help you develop that vision and strategy. 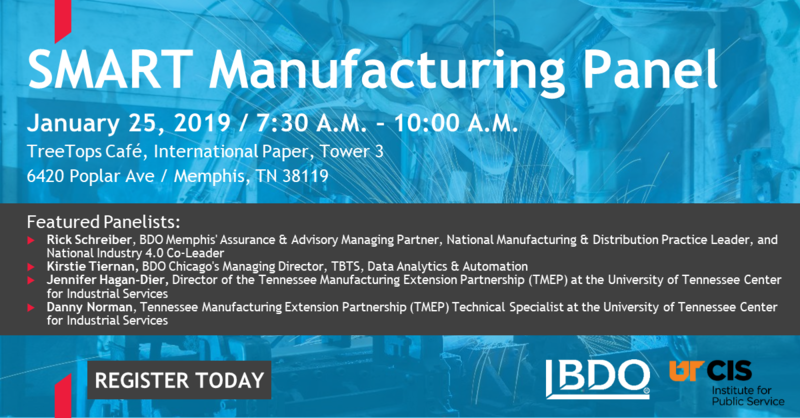 If you are interested in learning more about Smart Manufacturing, please join us as we partner with representatives from BDO on January 25th for a no cost panel discussion. UT CIS will also be bringing some additional learning opportunities to the Memphis area in February and March. These opportunities are perfect for those starting or already leading a lean transformation of for those needing a proven method to problem solving.